Customisation, scalability and usability are few of the different features that combine to make a good CMS. These features aid in making the website user-friendly. Check out below, our recommended list of content management for 2019. The best CMS is one that is easy for all user groups to operate whether visitors, website admins, etc. With good CMS one is not required to pay to their website development agency any fees every time for updating the website. It can be done by individuals themselves. However, the responsibility of updating website is not limited to just a single individual. It can be the responsibility of many people. For this reason, the content management system must be intuitive enough so that an individual can work on it even if they lack any prior training of it. This kind of websites offers users text and page for editing. Nowadays more businesses wish to do more than what their current websites offer. A survey conducted by Clutch.com states the use of better content and fastened mobility as the top requirements of 2017. Thus, if your business expects you to add dozens and more of web pages due to its increasing growth, then your CMS must be good enough to allow you to do the same. In case you wish to change the design of your company website, your CMS must let you do it easily. The main crux of choosing any CMS is to get one that you can rely on for many years to come. While changing the design is not a difficult task, changing the CMS of the website and keeping all the content intact is. Hence it is important to have a CMS that is able to offer fluidity and adapt to the business’ needs. Even though your CMS is good, you may face problems. Though a web development agency can help fix it, they may often not reply or charge huge fees. Sometimes a small guidance can aid in fixing the problem yourself. Thus, a good CMS must have an extensive support network, comprising of many blogs and forums where you can reach out during such moments to look for a solution. Google is the ultimate for getting traffic and new customers to your website. It accounts for a total of 90% of the entire web traffic. Thus, if your website fails to appear on google, you may miss out on a lot of customers and revenue too. Along with links, the way the website is built has a lot to do for generating traffic. If your CMS is SEO-friendly, the load of building a good customer base from Google increases. As per a survey, hacking of websites increased to over 32% in 2016 with more than 30,000 websites hacked each day. This makes website security a more important component. Having a secured CMS which is updated regularly, can do wonders, especially if cybersecurity firms offer a good CMS facility which is useful. You can create a customised CMS including all the features. However, that can be an expensive thing. But luckily one need not spend time and resources for developing a perfect content management system. There are many systems that already offer everything that you require to make a perfect website making it the best CMS choice for building a website in 2019. 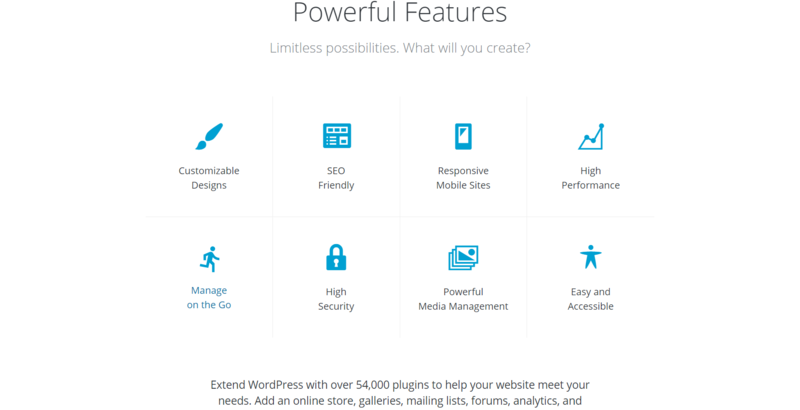 Why WordPress is the Best CMS for Businesses? Although WordPress started as a platform for blogging, it has grown on to be the choice of websites like the New Yorker who rely on it for their content management system. 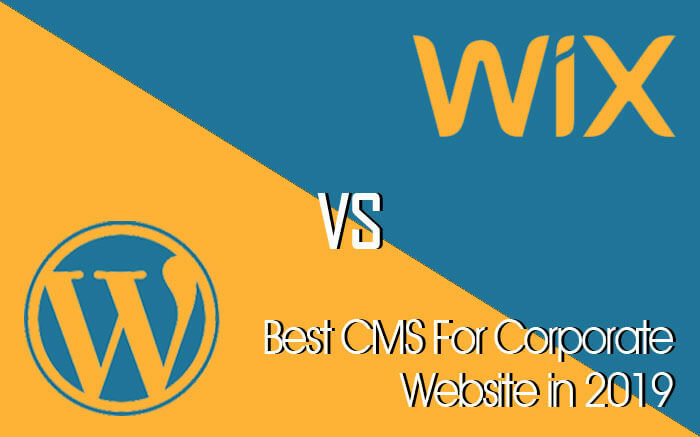 Thus, WordPress is the best CMS one can choose for their company in 2019. What makes WordPress the best is that it’s an open platform free for everyone to use. One doesn’t require any license or pay anything for using it. Though it may be noted as an irrelevant thing by businesses who pay to web development agencies for designing their websites, one can’t deny the use of WordPress by other businesses too. More than 30% of websites across the world are generated using WordPress. This means there is a big community that uses WordPress for generating blogs and dozens of forums. If you have any query regarding WordPress you can find a solution for it anywhere on the Internet. WordPress is one of the most authentic and customized CMS across the globe. Apart from millions of themes offered for starting a website, WordPress offers over 55,000 plugins which can be applied across various platforms for achieving the desired results. Right from uploading images on Instagram to including contact forms in your website, there is everything offered. You name it and it’s already available on WordPress. WordPress offers secured browsing from both hackers and staff. There are tools for approving content along with assigning administrative roles ensuring only the listed staff will be able to post any content or updates on the websites. The CMS is SLL compatible. In addition, it also includes various Security services approved by third party companies. With WordPress, you needn’t worry about ranking your website. Though you may require the aid of an SEO agency, WordPress is built with an excellent SEO-Friendly manner. The platform offers users various plugins that are exclusively designed for aiding users to optimize their website for SEO. Lastly, as it is a popular and widely used platform for content management, it hardly faces any shortage of web developers for designing the company’s website. One can use the Yoast.com and get everything sorted. One can’t deny the usability of WordPress applicable across any type of company or business. However, there is a better option if you are into e-commerce. Although WordPress has a lot of plugins presented to users for building their online store, Magento would be a better option as it is a CMS that is designed especially for E-Commerce. Similar to WordPress, Magento is an open source platform, which can be used by anyone. In addition, it also comprises of a huge support community for answering user queries related to software just like WordPress. As Magneto is used in myriad platforms, it makes it easier for companies dealing in website designing and development to build their website in lines of their thought. The companies can also upgrade and switch developers if the need be. Magento offers all facilities that are required to run an E-Commerce website in 2019, whether it is processing payments, generating billing and invoice through software, shipping and much more. In short, Magento can be termed as the WordPress of E-Commerce and CMSs. Even though Magento and WordPress are the two-most preferable site, it’s not necessary to use both of them. It depends which CMS you deem to use and whether you want to build your own website? In either sense, we do urge, to avoid the following platforms when building your own websites. Although it’s easy and less cumbersome, building a website, Wix is hardly recommended by experts. Here are a few reasons why. Foremost, the websites are constructed using templates. Though it is similar to WordPress, Wix includes no features to customise. Thus, your website would look no different than everyone. Secondly, the website has limited SEO utility. This makes it difficult to optimize the website and get good rankings. Wix provides limited scalability, making it impossible to move the website on different platforms. This means if your website sizes more than wix, you will have to create a fresh website. Lastly, there is no section for advice from the expert audience. Thus, very limited web development firms will opt for working on Wix Websites. Want to build a company website? Do you need help building websites? We at Triple W Media have specialised in building myriad websites for our clients. We work in tandem with our client needs. You can check through our portfolios and if you are impressed, we would be happy to guide you further. Get in touch and we will render you the best quotes for your website.